CT1 Power Grab n Bond – Powerful adhesive / sealant for demanding internal and external gluing jobs! Using Power Grab ‘n’ Bond there is absolutely no need for any additional fixings. Power Grab n Bond has a capacity to adhere to endless materials such as stone, granite, slate, marble, concrete, all metals (including alloys), polystyrene and most plastics. Power Grab n Bond’s ability to bond combined materials such as wood to concrete or stainless steel to stone is incredible. 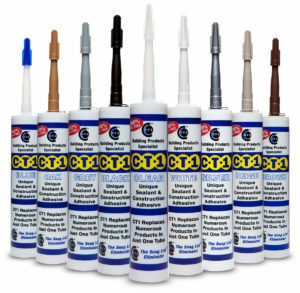 CT1 Sealant and Adhesive – The one-stop product for all sealing and bonding. It will never shrink or crack and it can be structured and painted with any type of paint. When applying conventional sealants surfaces have to be dry. As a sealant, CT1 can be applied onto wet surfaces even underwater. As an adhesive, CT1 will create a formidable bond between virtually any materials also acting as a construction adhesive that will successfully bond all metals, glass, mirror, fibreglass, plastics, and stone, concrete, the list is endless.